Our feeling of love connects us to our strongest intuition center, which is our heart. 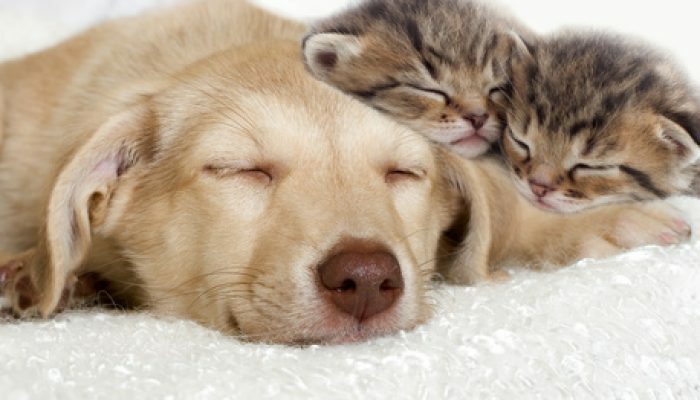 Our pets love us unconditionally, and when they do love us they are expressing their essence, which is unconditional love. It is this feeling of love that connects us to our strongest intuition center, which is our heart, the source of this most powerful positive emotion. When you love your pet back you are expressing your own essence of unconditional love. 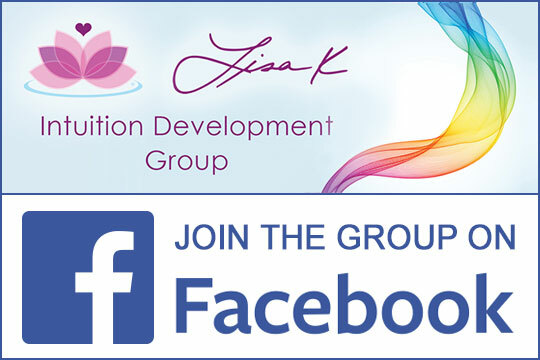 When you use unconditional love with your intuition, you ramp up and increase the higher vibration of your energy which makes it easier for you to connect to energy around you and to higher consciousness. The next time you hold your dog, cat or other beloved “fur- baby” as you connect to them with love see if you can sense what they are feeling or even thinking. You will find it is easier to pick up intuitive information from another person or pet when you feel unconditional love. This is what is meant by “opening your heart.” So open your heart to another and see what you pick up intuitively, you may be surprised. Obviously, our pets can’t speak like we do, so they don’t use words. They respond with actions that they’re urged or nudged to do. I experienced one instinctive cat nudge that if my husband wasn’t there to see it with me, I’m not sure I would have believed it actually happened! D’Artagnan, our synchronicity cat, was a rambunctious kitten and we still had our older cat, Shayna, with us. Shayna was about 12 years old, and D’Artagnan, or D as we call him, was a young-feisty-want-to-play-with-you all the time kitten. He was actually quite annoying, especially to Shayna who always kept her cool and would stare him down with her piercing steady glare which generally stopped his antics. One time the staring was not terribly effective as Shayna sat on the bed with little D rolling around in front of her face trying to coax her to play. D tried pawing in the air at her and wouldn’t stop. He sat up and looked so small in front of her, I told him, “You better stop D, Shayna’s big enough that she can put your whole head in her mouth.” In that instant Shayna opened her mouth and gently put it over his entire head! She didn’t hurt him, just placed his head in her open mouth and then pulled back, closed her mouth and stared at him. After that, D stopped bothering her. My husband and I were stunned! Did Shayna understand the words I said? Probably not, but she knew what I meant and had an instinctive urge and followed it. Intuition may compel you to do move in a certain direction, urge you to do something unusual, or make you feel something is different than before. Your pets can teach you how to be “in the now.” I learned how to do this when I was a very young girl. 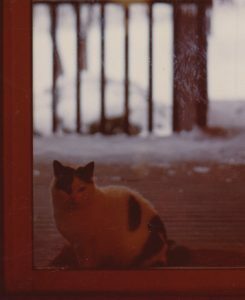 When I was a little girl I had a beautiful white and black spotted cat named Dorothy (below is an old photograph of her). She came to us as a stray one day when I was 5 years old. We found her on the back porch looking for food, and later we found out, for a place to have her kittens. She was a feral cat and didn’t seem to be owned by anyone, but even then she had a peaceful way about her and a wise knowing. I was the only one who could pick her up and hold her, even as a small child. Everyone else she would shy away from. She seemed to know I was a child that loved animals and I wouldn’t hurt her. Even though my Dad said, “Don’t feed her, she’ll never go away,” he was the one that felt sorry for her and fed her some leftover tuna fish. My Dad was right she never left. We ‘adopted’ her and she lived mostly outside and sometimes inside our house. She became my closest friend and companion. As I grew a little older, Dorothy and I would go for ‘walks’ in the evening. We lived in the suburbs that had residential houses spread fairly far apart separated by woods. I’d go out and walk with Dorothy, who followed me around the yard just after the sun went down. Many times I followed her as she wandered her territory. In the quiet we would often sit together, she would be a dozen or so feet away and we’d just be still and observe the night. I learned to listen, watch and feel the goings on in the darkness that turned brighter as my eyes adjusted. I could see and feel everything around us. Because she was a cat from out in the wild, this was her world. I didn’t know it then, but now I know it was a way to tune into my instinct, which is my intuition. Animals are in the “now” and react to what happens around them, whatever happens around them. They are aware of the ‘big picture’, the ‘what’s different this time’, or what’s happening that ‘I need to know right now.’ Intuition requires that you notice the ‘big picture’, so learning to be aware of what’s happening around you helps develop your intuitive senses. Learning to be aware of what’s happening around you helps develop your intuitive senses. When you’re walking your dog, or you watch your cat sitting in the window, you’ll notice that they are always on alert to what’s moving, making a sound, or what smells interesting. Next time you go for a walk with your dog see if you can notice what they notice before they do. 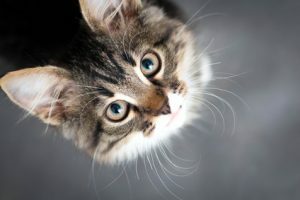 If you’re watching your cat sitting in the window or on the porch, see if you can see what they see.Our beloved pets are the most intuitive creatures in our house and you can certainly learn a lot about your own intuition from them. All you need to do is sit back and watch their behavior and be a little like them.